This month Legit Reviews looked at the Aerocool Xfire Cooler and the OCZ Tempest Cooler and found that more was left to be desired. With upcoming heat pipes like the OCZ ‘Z-12’ featuring twelve heat pipes things are starting to look better for air cooling, but they still are not out on the market yet. The crew over at Vigor Gaming contacted Legit Reviews and liked our no nonsense approach to reviews and offered to send out their latest TEC CPU cooling system, the Monsoon II. This week we take Monsoon II TEC cooling solution out of the box and compare it to the Aerocool Xfire, OCZ Tempest, Corsair’s Nautilus 500 water cooler and of course the retail box HSF by Intel. We again used the ever popular Intel Core 2 Duo E6300 ‘Allendale’ processor at default timings and then again with a 1GHz overclock to see how it does with the core voltage increased and the Front Side Bus moving along at 400MHz (Default is 266MHz). The Monsoon II one of the largest heat sinks that we have ever used and believe it or not it tips the scales at 839.15 grams or 1.85 pounds for all those die hard folks in America. The cooler dimensions are 139.95mm(L) x 94.99mm (W) x 160.02mm (H) making the Monsoon II the by far the heaviest and tallest cooler that we have reviewed in recent times. The Monsoon II is cooled by a seven blade 92mm fan that puts out an unknown about of air, but since it tops out at 2600 RPM’s a logical guess would be about 46CFM at 2600RPM +/-10%. The fan is 92mm is a little bit louder than the 23.53dB Xfire and 33.0dB Tempest that we looked at in recent weeks. In all honesty the fan deserves its own section and will later in the review. 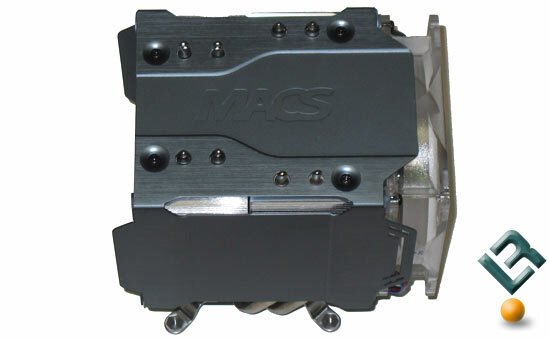 The MACS Monsoon II has four copper heat pipes that transfer heat from the base of the heatsink to the set of 45 aluminum cooling fins. These heat pipes are sealed in design and look to be well attached to the cooling fins. 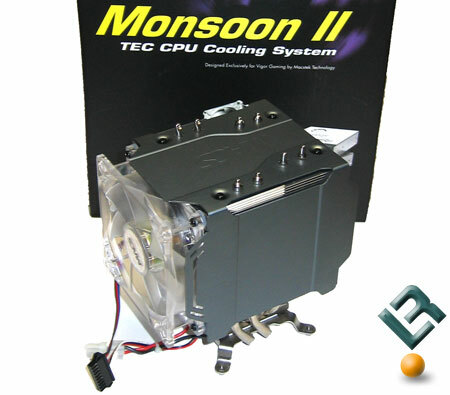 The top of the Monsoon II says MACS, which stands for Monsoon Active Cooling System. The heat pipes come through the top of the housing and the overall assembly is visually nice. One other thing to note is that the cooling fins are actually split into two groups of 45 and each one has a pair of heat pipes connected to them. The heat pipes go all the way through the base as seen above, but as you can tell the base has a couple of plates and wires connected to it. 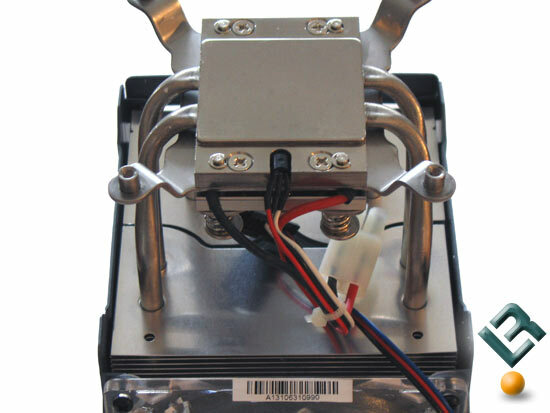 The Monsoon II is a thermoelectric cooler (TEC cooler) which means it used the Peltier effect, the theory that there is a heating or cooling effect when electric current passes through two conductors. A voltage applied to the free ends of two dissimilar materials creates a temperature difference. With this temperature difference, Peltier cooling will cause heat to move from one end to the other. 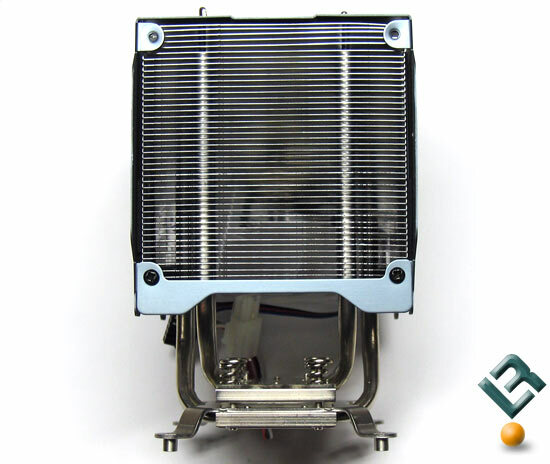 A typical thermoelectric cooler will consist of an array of p- and n- type semiconductor elements that act as the two dissimilar conductors. The array of elements is soldered between two ceramic plates, electrically in series and thermally in parallel. 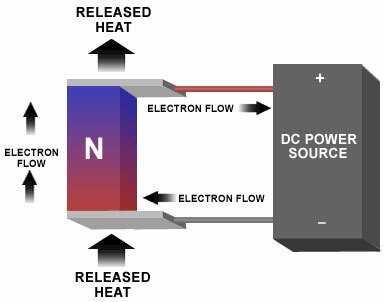 As a dc current passes through one or more pairs of elements from n- to p-, there is a decrease in temperature at the junction (“cold side”) resulting in the absorption of heat from the environment. The heat is carried through the cooler by electron transport and released on the opposite (“hot”) side as the electrons move from a high to low energy state. If everything goes as planned the electron flow should carry the heat from the hot plate to the cold plate thanks to the flow of electrons that is feed from the included control interface system that runs on a 12V power input. It sounds complex, but the Monsoon II is a plug-in-play cooling solution!